Xigmatek Reveals two New CPU Coolers. Xigmatek recently revealed two new CPU coolers which are built to provide high performance cooling to the processor. The two CPU coolers include the LOKI SD963 and the Gaia SD1283 and are aimed at budget users who want the superior performance while spending lesser than usual. 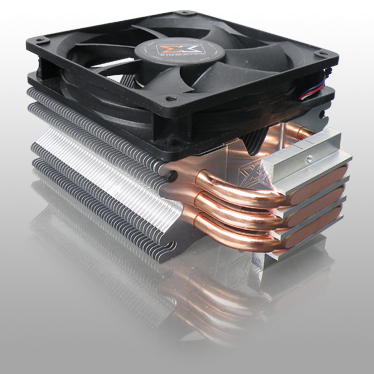 The LOKI SD963 is an tower shaped cooler which measures around 92 x 50 x 134 mm (W x H x D) and weighs 330 g. The cooler is made up of a thick aluminum array block which consists of small fins to which heat is transferred through 6 mm thick copper heat pipes make direct contact with the CPU at the base. A thing to be noticed that the narrower side of the Aluminium block is blocked which may affect the cooling performance as sufficient air wont be able to pass through it. However Xigmatek includes a 92 mm fan that spins at 1200~2800 rpm with a noise output of 20~28 dBA. The other fan is the Gaia SD1283 which also is a tower type cooler and a bit larger than the Loki. 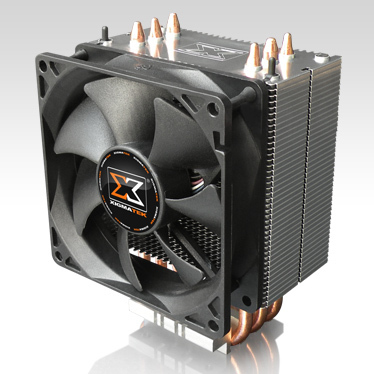 The cooler can equip two 120mm fans on both of its sides. It measures 20(W) x 50(D) x 159(H) mm and weighs around 460g. The cooler has a unique forked-X shaped fins that have a slight bump towards the center which provide better air flow. 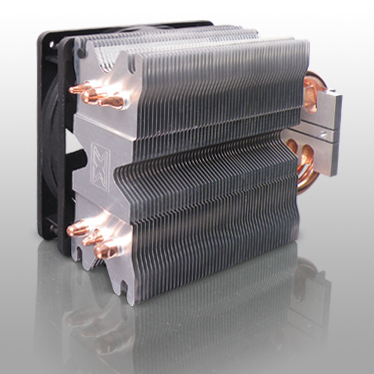 The aluminium fin block is equipped with 3 heatpipes which are 8mm thick making direct contact with the CPU. Its also bundled with a 120 mm spinner that does 800~1500 rpm with a noise output level of 16 to 24 dBA. Both fans are compatible with all the current CPU Sockets. Pricing and availability have not been revealed yet.